2018 We are sold out for this year. We want to wish you and your family a very Merry Christmas & a Happy New Year! We look forward to seeing you again next year. * We have 4 Fresh Cut Frasers, and 1 purple flocked, 1 red flocked & 1 white flocked tree remaining. If you are interested in one of these please call to setup an appointment (817) 297-3970. 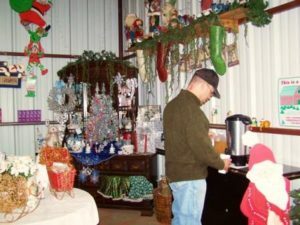 Santa Claus is coming to the farm! Bring your camera & your Christmas lists to share with Santa! There is NO admission charge to enter our Farm. 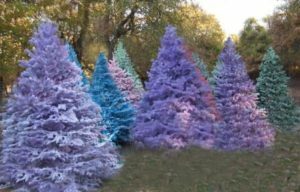 In 2018 look for white, red, purple, pink, black & blue flocked fir trees available, in various sizes of Frasers! Custom flocked trees available 24-48 hours after purchase.Fresh Handmade Wreaths! Bring your sack/picnic lunch and visit the picnic area with swings for the children to enjoy! 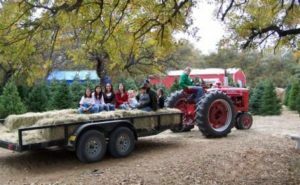 Make it an a memorable family day out while visiting the farm. Don’t forget to stop by our new weather station sign, it’s a great photo taking opportunity! Convenient location just 20 minutes south of Fort Worth! Great for photo opportunities for scrapbookers! Enjoy our cozy gift shop with woodburning fireplace! Complimentary Hot Cider and Coffee! *Photographers please see page directions for use of farm.